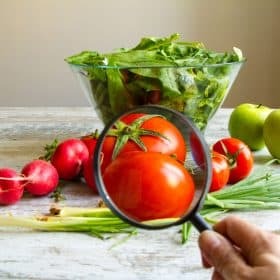 Chances are, you’re familiar with GMOs (Genetically Modified Organisms) – crops that have been altered at the genetic level to exhibit certain characteristics, such as pesticide or herbicide resistance. Today I reveal four hushed-up ways that GMOs can damage your bones and your general health, all backed up by scientific studies. We’re also going to dig deep into Monsanto’s Roundup (glyphosate) and the genetically modified crops that resist this harmful herbicide. But first, let’s take a quick look at GMO crops and how they came to be developed. Genetic modification is nothing new to botanists and plant scientists. Long ago, researchers learned to cross-pollinate and hybridize plants with desirable characteristics to produce higher yields and more flavorful crops. But the modern genetic modification of crops is something entirely different. Genetic modification in today’s sense means putting genes from one species into an entirely different species – such as injecting goats with spider genes so they will produce milk with a protein so strong, it can be used like Kevlar in industrial manufacturing; or injecting tomatoes with fish genes so they will resist freezing temperatures. Rice has even been injected with human genes to produce seeds that contain human immune system proteins, which are then used to manufacture and develop drugs. It’s really bizarre, frankly. And it has massive implications for your health. 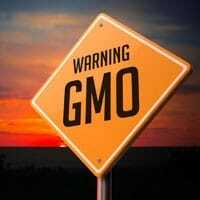 At the fundamental level, GMOs were developed to save time, effort, and to increase crop yields, but the terrible health consequences were obviously ignored. I’ll explain. Conventional farmers typically apply weed killers to their crops, primarily Monsanto’s Roundup. One of the problems with this approach, of course, is that this poison kills more than weeds; if the crop sprayers are not careful, the weed killer destroys the crops, too. To combat this problem, scientists made genetic modifications to various crops so they would become resistant to the active ingredient in Roundup: glyphosate. Now farmers could spray these “Roundup-ready” crops indiscriminately, applying weed killer to the entire field. Of course, this means Roundup ends up on the crops themselves, and ultimately on your plate. In the past, Monsanto went to great lengths to “prove” the safety of Roundup. But the evidence is impossible to ignore: the main ingredient in Roundup, glyphosate, is anything but safe. Research has revealed the toxic nature of this chemical. It is harmful in four key ways, all of which have been scientifically proven. When a substance is “estrogenic,” it means it has qualities like the hormone estrogen. A 2013 study reveals something ominous: glyphosate stimulates the growth of human breast cancer cells. Unfortunately, nearly all soy crops in the U.S. are GM, which means they are routinely sprayed with Roundup. The Save Our Program emphasizes Foundation Supplements, which are vitamins and minerals that are crucial for the rejuvenation of bone and the reversal of osteoporosis. And the preferred method of getting those nutrients is via good quality supplements and food…non-GMO food that has not been sprayed with Roundup, and here’s why. Manganese and zinc are both Foundation Supplements, and are required for healthy bone growth and rejuvenation. Glyphosate depletes minerals by chelation – a process whereby the chemical binds to a nutrient, preventing its synthesis and absorption. As a result, the nutrient-starved plants are more prone to disease, and of course they do not offer the nutrients our bodies need. Clearly, this is not a problem with a “quick fix”, so you should avoid genetically modified foods. The human gut is home to a vast number of microbes, and they are absolutely crucial to your bone health (and your health in general). 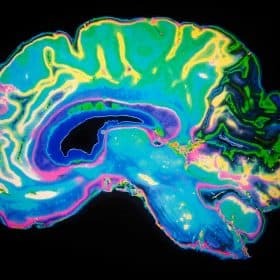 Scientists are beginning to unravel the complexities of the brain-gut connection, and they are learning more about why and how these microbes are so often imbalanced. One key element is the use of glyphosate. Unfortunately, the dangerous pathogenic bacteria, such as various Salmonella and Clostridium species, resist glyphosate; but beneficial bacteria, such as Bacillus badius, Bifidobacterium adolescentis, and Lactobacillus spp. are susceptible to it. In other words, glyphosate kills good bacteria while the bad bacteria are unaffected, setting the stage for pathogenic bacteria to gain the “upper hand” and cause disease. The liver is one of the body’s primary detoxification organs. One of its most important jobs is to remove toxins from the blood, and it does this through a complex series of enzymatic processes. According to research, glyphosate interferes with this vital process on a fundamental level. Glyphosate inhibits the main detoxifying enzymes collectively named cytochrome P450 (CYP), thus contributing to the chemical’s toxicity. Not only does glyphosate present its own dangers; but by “tying the hands” of your detoxification system, it opens the door for all sorts of food-borne chemicals to run rampant in your bloodstream, causing untold damage. Recent research reveals how, when glyphosate interferes with CYP enzymes, it acts in synergy with amino acid biosynthesis in the gut (enter good gut bacteria again) and impairs the serum transport of sulfate. The evidence is clear: glyphosate induces disease. The sad irony is that the very foods you take into your body in the name of health can actually be making you sick. But consumers are becoming more and more aware. Foods with the “GMO-free” label are selling like never before, and sales of organic produce are on the rise. And here’s another irony: non-GMO, organic foods play a key role in detoxifying your body. It really is amazing how important your liver is. As we saw in the studies above, when its detoxification abilities are compromised, your entire system suffers…and so do your bones. In fact, a functional liver is absolutely key in the fight against osteoporosis. You see, when your liver is working properly, it prevents bone-damaging toxins from acidifying your pH and therefore weakening your bones. It creates a more alkaline environment, so healthy bone remodeling and building can take place, and you can build your bones faster. This is why a periodic cleanse is so important. Cleansing allows your liver to “let go” of the toxins and process them so they can be excreted via the kidneys. 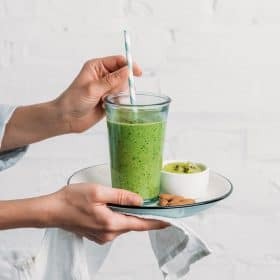 It’s like hitting the “re-set” button on your body’s detox processes, and it does not have to be difficult or complicated. 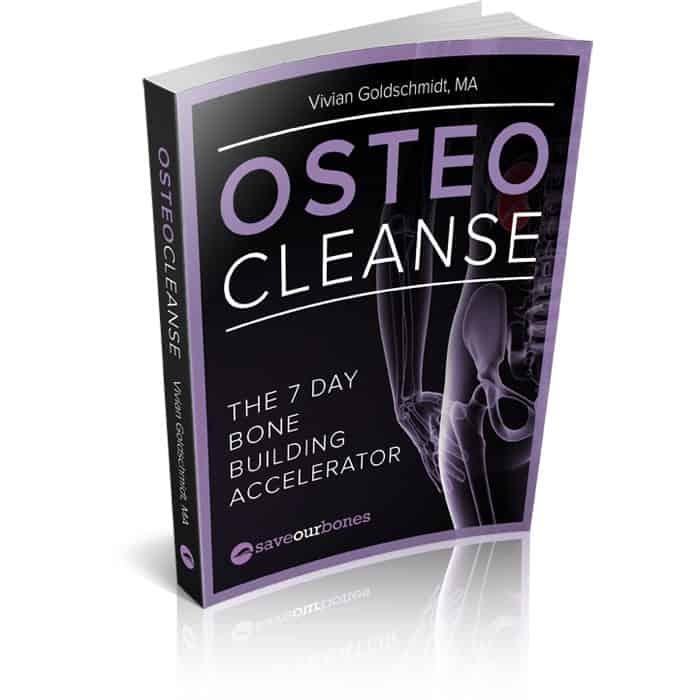 OsteoCleanse™: The 7 Day Bone Building Accelerator is just that: simple, effective, and, since it lasts just one week, it works quickly. OsteoCleanse™ is based in foods, pure water, and even breathing techniques that have been scientifically proven to cleanse and alkalize the body. In fact, not only is OsteoCleanse™ easy to follow; it can even be enjoyable, because you know you’re doing the best thing for your bones and body – and cleansing makes you feel younger and more energetic. I’m hoping other states will follow Vermont’s lead. The question is: Why doesn’t each state let the people decide on the labeling? We’re voting on a number of things soon. Why can’t we get this on the ballot? Hi Vivian – I have osteoporosis, and have been on Algaecal plus , and Vit D for the past 2 years. I also follow a alkaline diet, and exercise regularly. I just had a recent Dexa Scan hoping to see some improvement, but just the opposite. I was so discouraged to see my report. I go to see my doctor tomorrow and I know he is going to want me to go on prescription medication. Can you offer any insight as to what else I can do to fight this? I just finished reading the “Save our Bones” book and I am anxious to get started on a more alkaline diet. I am cleaning the cupboards of foods that are totally no-no’s. I have a couple foods that I need to know about. are chia seeds and sprouted flours. Your book makes a lot of sense and I feel it will really help me. Thank You! Thanks so much Vivian for broadening my perspective about GMOs and the chemistry of resistance to Roundup. A lot of people are not informed and wonder about all fuss. You’re welcome, Betty. Keep researching and learning! I ‘ve read Michigan will eventually have to label their GMO foods. I can’t wait for this to take place. I think it should be a Federal Law. Consumers are being treated dishonestly. Now who wants to be sick? It’s insane what is being allow to happen. Please encourage your State to label foods and your local areas to present information to the public! I’m interested in the OsteoCleanse, but I’m allergic to fructose (fruit). Can this food plan be adapted to work without it? You are so right, Suzy – information is the “fuel” to making smart choices! As far as your fructose allergy goes, OsteoCleanse involves mostly vegetables and some fruits, all rich in cleansing nutrients and antioxidants. You could certainly do the cleanse without including those fruits. There is a group called the Environmental Working Group (ewg@ewg.org) that works to protect many aspects of our environment. One thing they do is fight against GMO’s. They send you e-mails about issues and make it easy to join in petitions against such things, which go to Congress, the president, etc You can also donate to them. There are many natural ways to help get rid of weeds. I used 2 liters of white vinegar, 1/2 cup of cooking salt and a dash of detergent. Of course there are always some weeds that need digging out by hand such as onion weed and nut grass which are problems here in Australia. Sad about the bees, I have only two in my garden now and have to pollinate my pumpkins by hand. We have to take care of the planet or we will only be reading about what used to be in books. We should all try to grow some vegetables or fruit and propagate from our own seeds as we at least know they are natural. I know that some families are very busy and do not have much time but it is well worth it so teach your children now to have their own little garden. To eat fresh produce and cook something that was in your garden 10 minutes ago is very rewarding not to mention healthy. Very innovative, June. And I agree – it’s so important to teach the next generation about healthy food and where it comes from! Everyone is entitled to their opinion. So, buying organic is always an alternative. But if one is not in the agricultural field (farmer) trying to supply people with food, do not criticize the necessity for genetically modified fruits and vegetables. The delicious papayas that the people in Hawaii enjoy, as well as tourists, are GM. Otherwise, there would be no fruit. Too many bugs in the tropics. We lived in Fiji for six years, where the climate is even more tropical than Hawaii, and enjoyed many, many fruits that were not genetically modified, including papayas. In the tropics, one can get an incredible variety of fruits, all organic, without the need to genetically modify or treat them with Roundup. We were “farmers,” i.e., grew much of our own vegetables and had over 100 fruit trees. There was so much fruit growing wild on the island, without human modification, enough to feed the island’s 15,000 inhabitants and more! What good is a “delicious” fruit like the Hawaiian papaya if it is damaging the human body, including the farmers that are exposed to Roundup? What good is it if, as research has shown, glyphosate is destroying the bee population that is essential for pollinating our food, as well as damaging many other species of animals, birds, and insects, such as the Monarch butterfly? Are all of the Save Our Bones products only available in a downloadable format? I prefer hardcopies since computers and I do not get along very well. Good question! Some of our products are available only as digital PDF files, and some are offered in print or digital. The digital-only items are Densercise and OsteoCleanse. The Osteoporosis Reversal Program and Bone Appetit are available in either print or digital versions. I hope that helps answer your question! I’m confused. I use Round-Up in my flower beds and if ANY spray gets on the plants, they die quickly. I have to be extremely careful to just hit the weeds. So, I don’t understand how they can spray crops, have the product get on the crops, have the crops live and look so good that we buy them and eat these same crops! I totally agree I wouldn’t want to eat anything with this chemical on it but I don’t know how any plant lives so we have the possibility of eating it. The reason your flowers die when exposed to Roundup is because your flowers are not genetically modified to resist Roundup. That’s why scientists developed these scary GMO crops – so they would not die when hit with Roundup, but the weeds would. I want to encourage you to take a look at alternatives to Roundup, such as ground covers and weeding by hand (it’s a great way to get exercise!). That way, you, the environment, and your flowers are not exposed to this dangerous chemical! Sherrine, mulching or weeding by hand should be used instead of roundup. Monsanto, the manufacturer of roundup, has genetically modified all major crops (sugar beets, cotton, corn, canola, soy, and others) just to resist their spray. The farmers then are forced to buy their seed from monsanto all so they can spray their entire fields with roundup without killing the food crops, only the weeds. They are now pushing the use of roundup on bean crops right before harvest; this allows the greenery to begin dying back making harvesting of the beans easier, thus coating the beans with glyphosate right before harvest! Sherrine, you use Roundup?? Why?? Haven’t you read about all the dangers – it kills bees, probably causes cancer in people, pollutes the soil. Monsanto is an evil company. Good for you for taking action, Judith. The good news is, informed consumers are a mighty force for change, so keep spreading the truth! Vivian, I would appreciate it if you could provide links to the various studies. It is difficult to convince any one of the dangers of GMOs and Glyphosate without the original trial or study.